Definition at line 140 of file shellext.h. Definition at line 164 of file shellext.h. Referenced by CreateJunction(), delete_reparse_point(), Ext2InitializeReparseData(), and get_reparse_point(). Definition at line 151 of file shellext.h. Referenced by CreateJunction(), and get_reparse_point(). Referenced by BasepGetVolumeNameFromReparsePoint(), CreateDirectoryExW(), CreateJunction(), QueryVolumeName(), RemoveDirectoryW(), and TestIrpHandler(). Definition at line 152 of file shellext.h. 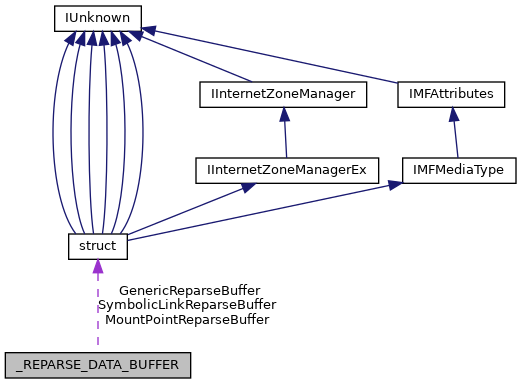 Referenced by build_reparse_buffer(), check_nfs41_getreparse_args(), BtrfsRecv::cmd_mkfile(), CreateDirectoryExW(), CreateJunction(), Ext2GetReparsePoint(), Ext2InitializeReparseData(), FsRtlValidateReparsePointBuffer(), get_reparse_block(), get_reparse_point(), IopDoNameTransmogrify(), nfs41_GetReparsePoint(), set_symlink(), and TestSymlinks(). Definition at line 150 of file shellext.h. Definition at line 149 of file shellext.h. Definition at line 142 of file shellext.h. Referenced by BtrfsRecv::cmd_mkfile(), CreateDirectoryExW(), CreateJunction(), delete_reparse_point(), get_reparse_block(), get_reparse_point(), IopCompleteRequest(), IopParseDevice(), nfs41_GetReparsePoint(), print_reparse_buffer(), TestIrpHandler(), and TestSymlinks(). Definition at line 141 of file shellext.h. Referenced by BasepGetVolumeNameFromReparsePoint(), BtrfsRecv::cmd_mkfile(), CreateDirectoryExW(), CreateJunction(), delete_reparse_point(), get_reparse_block(), get_reparse_point(), IopCompleteRequest(), IopParseDevice(), nfs41_GetReparsePoint(), NtfsCreateFile(), print_reparse_buffer(), TestIrpHandler(), and TestSymlinks(). Definition at line 143 of file shellext.h. Referenced by BtrfsRecv::cmd_mkfile(), CreateJunction(), get_reparse_block(), get_reparse_point(), IopCompleteRequest(), IopParseDevice(), nfs41_GetReparsePoint(), and print_reparse_buffer(). Definition at line 148 of file shellext.h. Definition at line 147 of file shellext.h. Referenced by CreateJunction(), Ext2InitializeReparseData(), FsRtlValidateReparsePointBuffer(), and get_reparse_point(). Referenced by BtrfsRecv::cmd_mkfile(), CreateJunction(), Ext2GetReparsePoint(), Ext2SetReparsePoint(), get_reparse_block(), get_reparse_point(), MountMgrValidateBackPointer(), nfs41_GetReparsePoint(), print_reparse_buffer(), set_reparse_point2(), set_symlink(), TestIrpHandler(), and TestSymlinks().